After living at my QTH for three years, it became time to do a better permanent install of my BigIr. Since moving in, when I did the initial install, all cables were on top the ground and I had to open the window to pull in the cables to operate. When I did the initial install, I used concrete for the mounting pipe and a dx engineering radial plate. I ultimately had 12 - 63' long radials in a u shape from the antenna, across the backyard and down both sides of the house. All in all, the BigIr worked fine. But, I had a goal of having all wires run into the house and to have the BigIr playing against a good ground screen. I also wanted all wires to enter the house without having to open a window and to make the antenna more pleasing to the eye (aka: YL approved)! HI! For the new install, I added an eighty meter coil kit to the antenna, drove an 8 ft ground rod into the ground at the base of the BigIr and added a lightening arrestor. The ground screen consists of 6 strips of hardware cloth (25' long x 3 ' wide) (450 square ft) laced together with insulated radial wire. The radial wire ties into the radial plate. Everything is lawn stapled in place. I did not remove the old radials and left them attached to radial plate. For the record, the 80 meter coil played fine before I started the ground screen project. This project took me all summer due to a variety of issues including rain. Here are some photos from the the project. In the top photo, you can see 2 strips of hardware cloth on the ground. At this time they are not laced together. You can also see the fake landscaping boulder, the 80meter coil and the ground rod with lightening arrestor. The 2nd photo is an alternative view. As can be seen, all cables are still on the ground. In this photo you can see the trench running next to the foundation. The bottom is covered with rock for drainage. Each piece of conduit has holes drilled in the bottom to allow condensation to run out. In this photo you see a final fitting of conduit, with heather head. All wires are still on the ground. You can see the 80 meter coil, ground rod and lightening arrestor. This photo shows, filling in the gap (with hardware cloth) caused by the location of the BigIr in relationship to the strips of hardware cloth. It should be noted that the runs of hardware cloth cannot go any further due to an upcoming patio installation. So, the Big Ir is definitely not centered which would have been ideal. The top photo shows the trench filled in. At this stage all wires are running in conduit. 2nd photo shows the trenching down the side of the house filled in. 3rd photo shows the conduit coming out the ground, topped with a weather head and all cables entering the house through the utility enclosure. I removed one brick to allow wire access. The utility enclosure is heavily caulked to avoid rain and critter access. Another shot of the base of the BigIr. You can see the wires coming out of the weather head, the ground rod with lightening arrestor and the balun. Note the new patio install. And the trench is filled in. In the top photo; you can see the 3rd and 4th strips of hardware cloth on the ground. The 2nd photo shows a short piece of hardware cloth fastened directly to the radial plate. The 3rd photo shows how the overlapping strips of hardware cloth were laced together. Every place the wire in the strip of hardware cloth crosses another wire (in the same strip) is bonded during the manufacturing process. You can see the lawn staples used to hold every thing down. Notice how the grass is already starting to encompass the first two strips of hardware cloth. 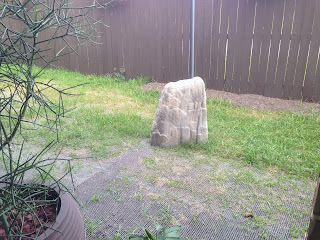 This photo shows the landscaping boulder in place. The Big Ir comes out the top of it. All coax, control wires etc, are covered by the "boulder". 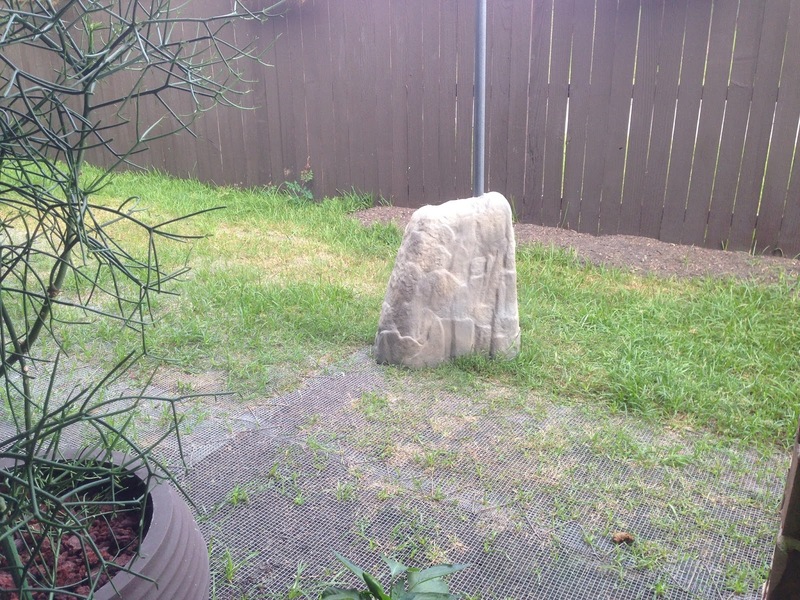 To get the BigIr to come out the top, I cut a hole in the top and then split the "boulder" up one side and most of the way across the top. 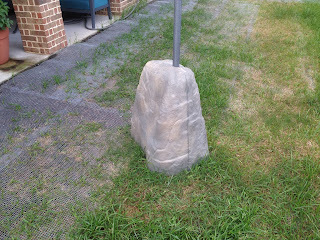 This allowed me to pry the boulder open to get the mast into the hole. This photo shows the split sealed shut using silicone caulking. You can also see the fifth strip of hardware cloth in place. The 6th strip of hardware cloth was used at the far end of the run to fill in some lawn area. Any radial wire left over after lacing hardware strips together was run into the yard. I used a total of 5 - 63 ft insulated radial wires for the new install. This equated to 315 ' of wire. So there you have it. With horrible band conditions I am getting very good on air reports. All bands are exhibiting good swr. I am pleased with this install. Could it be better yes. But overall, I am happy with it and so is my YL!